New episodes are uploaded every Wednesday. Enjoy! And please feel free to join in the conversation. I am often active on Facebook. Welcome to the first ever episode of The Mental Health Revolution! It’s time to meet your host, Kate Ashley-Norman and know more about what you should be excited for in the upcoming episodes. 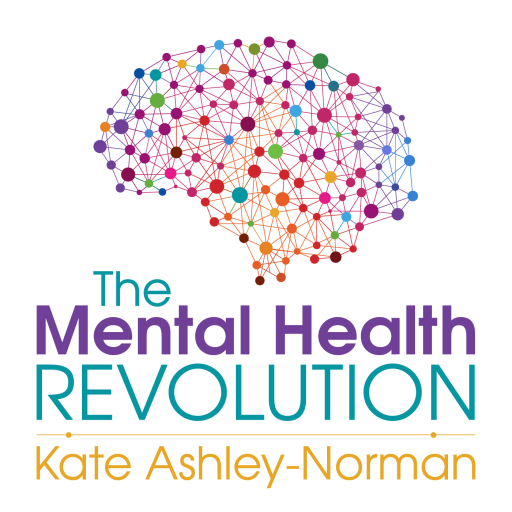 Discover how Kate is starting a revolution to change the way mental health is perceived nowadays through this podcast. She’s eager to start the REAL discussion on mental health and to put back the control of mental health in every individual’s hand. The problem is: everybody’s talking about it but the solutions presented in front of us (i.e. antidepressants) are not really doing anything. Kate says instead of improving mental health, it’s worsening it. It’s time to destigmatise it, demystify it, and de-medicalise it. Learn how to be in control of your own personal psychological foundations and how to maintain a good mental health so you start tuning in! Thank you for the resource and exploration. It seems to me that to experience well being requires needs to be met in the culture/community/within human beings. I’ve worked for years in the mental (ill) health system. I have suffered myself and seen family and friends suffering. We are in constant dynamic interaction with self and world and yet when the world hurts us and we react to it with suffering we have been educated to see these natural and normal reactions as personal problems that we must take responsibility to change ourselves to ‘get on with it’. We’re prescribed drugs and or sent for ‘therapy’ – the drugs are not as advertised ‘anti-depressants’ but drugs with a range of drug effects – I was prescribed them when struggling with a divorce and had an awful job and I went from being mildly depressed to completely emotionally numb and suicidal within two weeks. This terrifying reaction I have seen countless times in my role. Yes they might offer some people some respite from suffering via sedation, suppression of overwhelm, induce sleep, stimulate appetite etc but they cause much harm, emotional blunting, impotence, disrupt appetite and sleep, alter conduct, zone out, memory issues etc. Consider the grandiosity of the therapy industry – our literature proclaims we will teach people to be ‘their own therapists’ yet the average therapist is no better able to deal with suffering than anyone else – given the right or wrong set of circumstances in life and we suffer, we are not built to last and are fragile , feeling thinking skin wrapped skeletons of complexity. There are clear cultural causes of suffering we need to talk about – My own suffering has been directly linked to my job both current and past and this is what I hear most of in clinic namely how work/jobs cause and maintain huge amounts of harm to body, mind, relationships and possibility. The school system is another cause of harm for people often crushing self-esteem lifelong. Yet people are so conditioned into this sickening normality that we find it so hard to look honestly at job harms – often because to do so means confronting what seems like a massive immovable object blocking our paths to wellbeing because as the beaten down refrain goes ‘we’ve just got to get on with it’. When do we say no and demand a better way for our human family? Reduce the working week, educate for knowledge, development and understanding not school targets and jobs. The therapy industry is more like a production line where all that really matters are the targets ‘recovery’ and ‘access’ or waiting times – the former is like god almighty and are actually linked to continued service funding and the micro management of staff – given the gravity of this you would think they would be based on something robust and meaningful but recovery is not really recovery but a paper recovery – should you score ‘below clinical’ on two tick box self-assessment measures the PHQ9 (created by psychiatrists on the DSM depression task force with a grant from Pfizer) and the GAD, then we have a winner and you are now ‘recovered’ all from at most 12 x 50 minute sessions most likely 6×50 or 6x 30 minute sessions. Sounds unbelievable I know but this is the reality in IAPT. Not only is recovery in this context meaningless the targets are always increasing and staff burnout is through the roof nationwide. I have known therapists so stressed they are experiencing suicidal thoughts while doing therapy. I am often so exhausted I can barely listen to what the distressed person is telling me, and my life is a chronic routine based around dealing with and recovery from my job. Move into Secondary Care services and the level of staff burn out is just as bad if not worse. So we have a mental (ill) health system causing staff mental health problems – how utterly backward and abusive.